However, to my surprise, no academic in Pakistan stood up to publicly condemn this travesty. No newspaper headlined nor inner-paged that discovery. And the most bold chutzpah of it all, the plagiarist, the so called physicist of Pakistan, has written the following brazen tirade, reproduced below. The one thing I am no longer surprised at in this masterpiece wholesale theft of intellectual property in academic plagiarism is the attitude of the lofty and learned academics of Pakistan, the various Distinguished National Professors, the tenured professors, and the wanna be tenured and DNPs, all sucking off of the gravy-train of HEC, and remaining silent to this travesty. With the notable exception of physicist Dr. Pervez Hoodbhoy, who is evidently no friend of mine after I had him pegged as the Jewish ventriloquist voice of Daniel Pipes (see The Niggers of Pakistan ), and one or two other bold academic names who have publicly written in general against HEC's policies in the Dawn and other Pakistani dailies but shrewdly stayed publicly silent on this most grotesque and shocking discovery of plagiarism that was directly aided and abetted by the institutional policies crafted by HEC and its head honchos, no one evidently cared enough to speak up. I do applaud the few names noted in the full plagiarism report who did speak up privately in email. But not sufficiently loud enough, nor boldly enough, nor accurately enough, to make any difference. 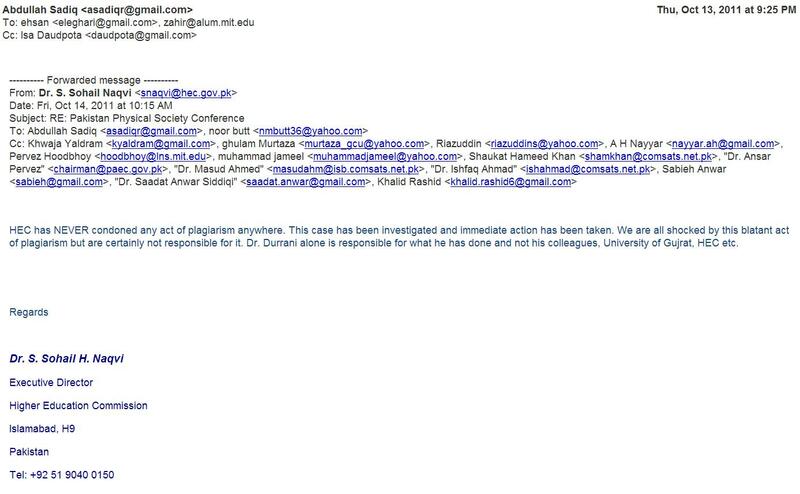 Indeed, of the 110 plus Vice Chancellors and senior academics of Pakistani public and private sector universities who were apprised of this case of plagiarism by yours truly (see the names of these public individuals occupying the highest pulpits of Pakistan's academia in the plagiarism distribution-list), not one spoke up publicly as far as this scribe is aware. To the credit of my confrere Ehsan Legari, a non-academic private citizen of Pakistan, who is maligned in the tirade by the plagiarist, was the only person evidently man enough in all of Pakistan to speak up on this egregious theft of intellectual property while all and sundry paid professors of Pakistan just watched silently. Am I permitted an explicative here? Indeed, it is entirely unsurprising that after Pakistan's number one physicist Dr. Riazuddin's passing away, this mentally deranged plagiarist has now come out lashing against those who caught him red handed. Professor Riazuddin, who was also my friend, was to be my star witness in any hearing before the Supreme Court of Pakistan! See the narrative in the full report (cited  above) wherein that cold statement of calling Dr. Riazuddin and all the pertinent Distinguished National Professors of Pakistan sucking off of its gravy-train before the highest court in the land was publicly and un varnishingly made by this scribe. It does take both intellectual and moral courage to speak up --- something that is evidently in abundant short supply in Pakistan. Many of these same academics are absolutely pious, never tell a lie I am sure, never cheat I am equally certain, and guard their own narrow moral interests with utmost jealousy lest these be stolen or compromised; I can surely vouch personally for at least some of them. Many of these academics of Pakistan are my close friends, colleagues, and also teachers. But in that struggle-space for daily bread that is Pakistan, and in-between pious hypocrisies, there is evidently no room for moral courage. The chutzpatic tirade of the plagiarist is reproduced below. Here is an amusing statement by this sorry fellow: "Finally Mr Ehsan Leghari is Mr Zahir Ebrahim's protege , who has been maligning the author and the HEC, for reasons purely mundane as he could not get a slot as an HEC Visiting Faculty Member and was/is condemned to live as a carpetbagger across the pond. An anarchist to boot Mr ZE should not let his Gehenna spillover on others." Google Durrani AND Plagiarism. This evidently newly “traumatized Jew” so piously protesting that “Palestinians are throwing stones at his right to occupy their homeland”, is also going around to webmasters and to Google Groups, trying to remove all public references to his being caught red-handed in his villainy by making it sound like those who caught him red handed are the ones at fault: “The POST submitted by Mr ZAHIR is grotesque and carries all the marks of a distorted mind---it violates DMCA with impunity, it criminalizes the WIPO laws, it imputes criminally and then its cuts athwart the strict guidelines laid down by the estimable google groups forum. There is absolutely no space on this Forum neither for the UR L nor its malicious and fallacious comments. I entreat you the webmaster, to clear the forum of this trash ASAP. If Drones were not enough the US let loose a daisy cutter in the ungainly form of ZAHIR EBRAHIM with his brand of profane and distorted.logic. I am sure you will acquiesce to my request and rip off the URL and the content and make this FORUM a respectable place for exchange of intellect rather than wallow in morbidity of some alien carpetbagger!!”. The plagiarist carries on his chutzpah in evidently his 2014 New Year's resolution crusade to get rid of all public references to his being caught with his pants down, on Jan 02, 2014 in Google forum presspakistan: “I would like to one last time under pin the fact that posts presented by PressPakistan should conform to the guidelines laid down A case in counter point is ZAHIR EBRAHIM'S OBNOXIOUS POSTING. How it got through the filtering process beats me. It (the post) is full of venom, is totally treacherous and vindictive and cuts athwart all boundaries of civilized human behaviour. It breaks into smithereens the WIPO act, it violates the DMCA which is a crime; ZAHIR commits the crime of imputation . In short the POST is sanguinary and may lead to violence, It would be better to rip it down and/or hang it around ZAHIR's bloated neck. Carpet baggers are traitors in all cases they should be forbidden and be ostracised from interacting with their ex colleagues. IF Z had a grouse with the HEC he should have had the moral courage to come out all guns blazing rather than act as a nondescript mouse eating into the vitals of innocent people. Dr IR Durrani”. The posting referred to in that tirade was an early version of the Letter to Editor . It would not at all surprise me if this plagiarist once again makes an appearance gainfully employed in Pakistan's academia with renewed blessings of the new crop of leaders at HEC. The way the former HEC leadership hushed up the plagiarism scandal in 2011, and its noble beneficiaries living off of its gravy-train managed to keep the scandal out of the press while putting all the blame privately on the plagiarist, something is surely afoot to quietly reinstate the plagiarist as was done once before when the same plagiarist was dismissed for the same crime of intellectual property theft from the Punjab University only to reappear a few years later at the University of Gujrat where I caught him. Well, the shameless fact of the matter as of this update is that this same plagiarist indeed went on to hold other academic positions in Pakistan after he was let go at the University of Gujrat, including as Vice Chancellor of University of South Asia, Lahore! ( see link7) My goodness... Do I have a crystal ball? This plagiarist is really plugged into the web of power in Pakistan. What is the value of this glorified white elephant called HEC? The brainchild of the former dictator in-chief of Pakistan, army strongman and president General Pervez Musharaf, and run by his hand picked sycophants and obsequious yes-men at the top who set the precedent for those who have followed them under other political governments, this idiotic and inept institution which has destroyed the higher education system of Pakistan by its foolish and poorly implemented policies that have empirically only fostered academic corruption until this very day, cannot even enforce its own feigned protestations: “HEC has NEVER condoned any act of plagiarism anywhere. We are all shocked by this blatant act of plagiarism but are certainly not responsible for it. Dr. Durrani alone is responsible for what he has done and not his colleagues, University of Gujrat, HEC etc.” (see HEC Executive Director's email below). They don't seem to care. Only the Question of truth can inform on the question of justice, except of course when the Queen is the judge and the Mad Hatter the jury! When untruth prevails, even as glaring a theft as the theft of Palestine when it becomes a fait accompli, is looked upon as the indigenous Palestinians are the terrorist who exist on their own homeland and the Israelis are the innocent victim of their aggression! An entire generation, maybe two, has been raised in the United States of America with that false belief. Caption The stone-throwing child scaring the Israelis in Palestine: Yes only in Alice in Wonderland at the Mad Hatter's Unbirthday Party celebrations! HEC has NEVER condoned any act of plagiarism anywhere. The case has been investigated and immediate action has been taken. We are all shocked by this blatant act of plagiarism but are certainly not responsible for it. Dr. Durrani alone is responsible for what he has done and not his colleagues, University of Gujrat, HEC etc. Do read the full report ( above) submitted to the Supreme Court of Pakistan by this scribe if this letter confuses you, or you are unaware of the Masterpiece of Plagiarism in Pakistan that directly stops on the doorstep of HEC, Pakistan's lofty Higher Education Commission which has entirely destroyed Pakistan's higher education. While this latter point may be a particular point of view of this author not to be contested before those who have benefited from HEC's policies, but before a sensible and rational court of law with full evidence, you still have the choice of speaking up -- or staying silent -- on the masterpiece of this plagiarism caught by this scribe and analyzed to the point of accurately dissecting its causality. Physicists and scientists, of all peoples, surely must appreciate the fact that focus was forensically moved from the visible effects to highlighting the hidden first cause! The plagiarist, caught red-handed, is merely the symptom of the corruption in the academic system itself. Any chemotherapy for this cancer can only be effective when the root cause is sensibly targeted --- before the patient is completely comatose or dead! But such potent efficacy cannot be affected by those in the system itself, especially by those who are benefiting from its dysfunction! Some, even if a handful, in Pakistan's academia must surely still care about truth, regardless of the price of bread and tomatoes. They must surely care what they are teaching to their students by example when their own academicians flourish in plagiarism ridden accolades and paper-mills. Your students and those who look up to you as role model to pattern their life on, are watching what you do. Not what you say, but what you actually do! I look forward to the Supreme Court eventually picking up the case --- before all of us are dead --- and if they ever do so while I am alive, some of you may be summoned to testify under oath (if I can have my way). The report is being resubmitted to the highest bench in Pakistan now that a new chief justice has been inaugurated. The travesty highlighted in this Masterpiece of Plagiarism in Pakistan affects us all. And so does pursuing or not pursuing its cure. Your printing this letter and circulating it in the Pakistani academia is essential for extirpating this primary evil in education from which all else, both good and evil, naturally follow. Please download the full report PDF and share with your students and colleagues. Post this letter on your website. But do you even dare to break your shameless silence? 100% copied from Valery P. Dmitriyev's 2002 paper titled "Can we derive the Lorentz force from Maxwell’s equations?" 100% copied from MV Lokajicek's 2007 paper titled "The velocity increase of mass and the classical physics"
100% copy of Bikas K. Chakrabarti's 2007 paper with the full title "History of Economics: An Outsider's Account"
100% copy of 2006 paper by Mogens Jensen, etc. with the title "Fear and its Implications for Stock markets"
100% copy of 2005 paper by A. S. Elgazzar, etc. titled "On complex adaptive systems and terrorism"